1 – Firstly, can you tell me who the Irish Housing Network are and why you got organised? The Irish Housing Network are a collection of 8 grassroots community housing and homeless groups. The groups include North Dublin Bay Housing Crisis Committee, Help 4 the Homeless Ballyfermot, Housing Action Now, An Spreach-Housing Action Collective, A Lending Hand, Social Workers Action Network, The Hub and Help the Hidden Homeless. The groups come from various perspectives and responses to components of the housing and homeless crisis. Housing Action Now for example emerged out of the community activists, researchers and young left wing activists coming together with a broad analysis of the housing crisis and with an interest in action. Groups such as North Dublin Bay HCC grew as a collection of mothers on the social housing waiting list who started taking direct action to highlight the crisis and are now building out and organising in their community as well as in the network. A Lending Hand and Help 4 the Homeless Ballyfermot both emerged as emergency responses to homelessness, providing food and clothing for those in need. Groups such as An Spreach provide an anti-capitalist narrative with an emphasis on direction action and reclaiming homes, the Hub emphasis legal supports, the Social Workers Action Network, a radical position on service providers and Help the Hidden Homeless focus on a specific aspect of the crisis in terms of those in temporary accommodation. Many groups were already radical others became more so following engagement in direct action and through emerging radical analysis in the aftermath of government policy decisions and damning failures for example after the death of Jonathan Corrie in the Winter of 2014-2015. After much fan fair and press coverage for those on the ground the crisis was only getting worse not better. With many different perspectives and approaches a common line was found to form a housing network in terms of a common set of principles, agreed structures and a starting set of demands. All are on the Facebook page of the network and emphases grassroots organising, democracy and mutual solidarity as the basis for action on this crisis. 2 – You have reclaimed the Bolt Hostel and Bolton Street? How and why did you do this? With the network formed in May we were immediate throw into, what we saw as, necessary action. Cases were flooding forward through individual groups and the network as a whole which showed the depths of the crisis. 4 cases a mother 6 months pregnant with a young child handed only a sleeping bag the night before, a mother of 3 also handed a sleeping bag, a couple who had been asked to split up to get emergency accommodation and a mental health patient released with no supports were all wiling to come forward to take their case directly to DCC. We occupied their offices at Wood Quay, demanding negotiations and for these people to be provided for. After 4 hours of negotiation and a continued presence of 40-70 activists we won that battle. In many ways this solidified our organising capacity and our ability to take action. From here we went on to occupy the Department of the Environment which lead to negotiations with senior department staff, but no concrete tangible win and fight for 2 straight weeks with Alan and Kellie in South Dublin County Council. They had been provided with only a sleeping bag, Alan seriously sick his partner Kellie also his carer. They wanted temporary accommodation and as Alan had custody of his son for 4 days a week, we want to make sure he could have his son visit. Alan and Kellie and activists in the network slept in DCC for 3 nights, outside DCC for another 3 nights and were injuncted for their actions. All of these previous actions built up to the Bolt Hostel on Bolton Street. We have taken on the Council and the Department and now we felt we needed to take matters in our own hands and directly house those in need. It was ambitious but a logical next step in many ways and something which we emphasized as common sense (all be it a radical common sense). If there are vacant properties they should be put to use. Housing need before greed. We cannot talk about the specifics of how we got in but once in we set up organising rotas for the space, teams to handle aspects such as maintenance, residence, defense, media and community/support building. The building, a formed homeless hostel had been vacant for 3 years but was in surprisingly good nick so we set to work. With everything ready to go and the building publicly launched on July 3rd we open negotiations with Dublin City Council also. 3 – What are you hoping to achieve and have you had any contact with the Council? Initially we were more then happy to form some type of deal. Our position was modest. We wanted this building put to use. Who by, was not the most important, be it council, community, charity or network as long as in was put to use. We wanted a guarantee of this. If this space could not be used we wanted a swap agreement on another property, work on community facilitates and a broader range of points connected to our demands. DCC entertained these demands but in the end they send an ultimatum offering only a possible partnership in the future and requesting an immediate vacation from the property, with legal proceedings including an injunction to follow if necessary. We were prepared for this and had built huge media support, local community support and called a rally for the day that DCC’s final offer was due to come in. We rejected DCC (none) offer. Following on from this was deafening silence from DCC untill later the next week. 3 letters were sent to the Hostel. One to Seamus Farrell and Aisling Hedderman and one to general ‘trespassers’. They threatened to sue us for full costs in terms of damage to the building and any legal costs. Targeting two specific members of the network was malicious, Aisling herself a single mother with 2 children. Vans and cars have been outside filming the building for days and on Monday the 20th an unmarked grey van and a DCC van pulled out scouting the back entrance and filming the back on the building. 4 – What has been the local community support like? Amazing. The local community sent a women up to meet up early on. Tenants and businesses wanted reasurance on our actions. She backed us 100 percent. We followed this up with stalls and door knocking where, again, support was overwhelming. Many stories came forward from former residence of the hostel, from locals who felt abandoned by the council and the state and from locals who were steadfast in their willingness to help us. We followed this work with a community fun day in the Dorset St Upper Flats. 50 children were out having their hair braided, faces painted and collectively made a banner with us to put up on the hostel. We had a barbeque and many children and parents said it was the best thing in the area to happen for a long time. That is what matters, providing for and building with the community in any of these struggles. 5 – The trade union movement recently passed a motion, put forward by IMPACT trade union, at the ICTU BDC recognising homelessness and lack of public housing as a major issue. Have you received any support from the movement? Thus far we have had general support from more left leaning union members and activists. They see the crossover between the community and where they work and stand with us. Outside of that, we have limited support thus far but have also not reached out yet as we have put emphasis on building from the grassroots and the community first. In the coming months Trade Union support will be crucial for us and to tackle the wider homeless and housing crisis. 6 – What can class conscious trade unionists and community activists do to support this action? Firstly, publicise what we are doing. Secondly, drop down and help out and donate. Thirdly, build support from with your union/s to help and work with us in the future. Finally, build the trade union movement itself into a fighting movement, a movement that sees an pushes class struggle. A strong radical, democratic trade union movement that fights, at the end of the day, is the best thing that can help all struggles in Ireland, from our housing battles, to wider community fights to more substantive change to make this a justice Ireland. The Trade Union Left Forum submitted our thoughts to right2water on the proposals for a policy document for a progressive Irish Government, as did many other groups. The number of submissions is a good indication of both the breadth of the right2water movement and the depth of the politics of those individuals and groups involved. Both are clear strengths of the movement and unity amongst all these people and groups should be maintained. There is strength in unity and weakness comes from division. “The reference to the Democratic Programme is important. This programme represented a brave and radical social, political and economic vision for Ireland that had the support of working people and the mostadvanced elements of both the republican and the trade union movement. However, we must keep in mind the fact the Free State and subsequent governments of Ireland have never sought to implement such a programme, because it is not in their class interests to do so. This state is a compromise with imperialism, and it will not help deliver any meaningful change for working people. Today, the fact that five unions have been central to the biggest mass mobilisation and social movement in decades is in itself a progressive turn, constituting an important step forward for the trade union movement and for workers more generally. For too long, unions have been formally on the sidelines of important political and social struggles. It is crucial to the future of the union movement, and to working people generally, that we in the movement develop a coherent and concrete programme, with workers and communities, that challenges the power of capital and big business in Ireland. If we are to secure lasting gains and increase our collective power, the movement must have a political agenda and a vision that empower working people and shift the balance of power in the country towards working people. We have seen how easy it is in a crisis for companies and the government to do away with gains that took decades of struggle by working people to win. In a short number of years, defined-benefit pension schemes have been virtually wiped out, the working week lengthened, pay cut, unemployment greatly increased, contracts made more flexible for capital, and much more. While unions are now beginning to win difficult pay increases again, these are wiped out through increased taxes and the monetisation or privatisation of social services. Unions need to push for a coherent programme that sees wins in the work-place, complemented and enhanced by legislation and the provision of quality public services. The sale of the State’s remaining stake in Aer Lingus marks the low point, so far, in the labour movement’s capitulation to neo-liberalism and move away from even a semblance of social-democratic politics, never mind socialism. Although only 25.1% of the once publically-owned national airline remained in State hands until yesterday’s Dáil vote to sell it to the international conglomerate IAG, it did still maintain a degree a democratic influence on the key transport company. The selloff of this profitable state asset has been accompanied by far-fetched tales. These include the claim that Dublin Airport, based on an island with direct land transport links to a hinterland with a population of 4.5 million people, will be developed as a ‘hub’ by IAG in preference to airports located in the South East of England – which has a hinterland extending from the UK to continental Europe by rail. However, the far-fetched tale that will concern workers the most is that ‘guarantees’ hastily included in letters from management, in the soon to be defunct Aer Lingus head office, carry any weight when it comes to protecting jobs and conditions from a company with a long track record of asset striping. Perhaps the most disturbing aspect, for principled trade unionists, of the rushed fire sale of this public asset is the connivance of the Labour Party and possibly senior members of our movement in attempting to hide the move from democratic inspection. At the Labour Party conference in March, a motion that was proposed by a group of TDs, was passed, claiming they would oppose any sale of Aer Lingus until guarantees related to the national interest in terms of maintained air transport links and guarantees for workers were met. In doing this, the group of TDs set themselves up as a pseudo-gang feigning concern for workers’ interests. As the Government finally moved to dispose of the state asset within two days, under the contrived smoke screen of the marriage equality referendum result and the conclusion of public sector pay talks, this grouping immediately declared their concerns satisfied, without any basis, so further undermining the possibility of organised opposition to the sale. Of even greater concern for trade unionists will be the role of our movement in meekly accepting this disposal of a state asset. Both the major unions in Aer Lingus, SIPTU and Impact, had already accepted in principle that they would not oppose, beyond mere verbiage, the sale. However, when even minor demands in relation to protecting workers terms of employment and jobs were not met by the company, little was heard. The only conclusion that can be drawn from the debacle is that the leadership of some of our unions are so enthralled to the Labour Party agenda of social and economic liberalism that they are willing to jettison any commitment to the concept of democratic control of key state assets. We can have all the 5 point and 10 point plans for a fairer better way but if we do not resist and struggle against privatisation we are complicit in the increasing corporatisation of society. 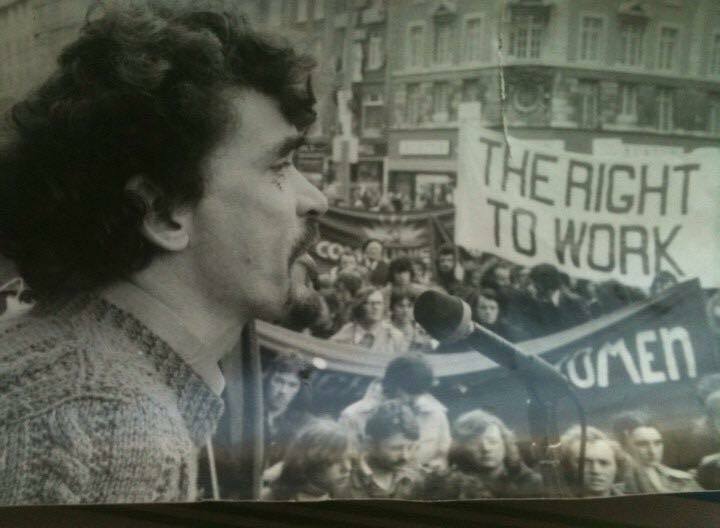 The Trade Union Left Forum wishes to salute and honour the life of Tom Redmond who passed away yesterday. Tom was a committed and passionate trade unionist, republican and communist. He embodied the living spirit of Marxism in both his activity and in his writings and thinking. He would always challenge himself and others to take on board new experiences and revaluate the old in light of the new. Active throughout his life in both Ireland and Britain he was an activist in SIPTU, the Communist Party of Ireland and most recently the Trade Union Left Forum, amongst many other groups. The unemployed struggles, housing battles and tax marches all benefited from Toms experience and energy. For new and younger activists coming through in recent years, despite Tom’s age, he was a breath of fresh air. Never patronising, always willing to listen but also to remind younger comrades of lessons he had learned and witnessed. Right up to the end Tom participated in debates about strategy and tactics for unions, parties and the class. The Trade Union Left Forum sends our deepest sympathies but also our thanks to his four children Simon, Eoin, Niall, Karl and all his extended family. Tom will live on in the hearts, minds and activities of all workers trying to build a better Ireland and better world. This is the tribute we commit to for Tom Redmond, our comrade and a true working class hero. Reposing at the Brian McElroy Funeral Home, Crumlin Village, Dublin 12 on Friday, 22nd May, from 7pm to 9pm. Funeral Service on Saturday, May 23, at 12.40pm in Glasnevin Crematorium followed by Cremation. Family flowers only please. Donations, if desired, to Our Lady’s Hospice, Harolds Cross. The support shown for striking Dublin Bus and Bus Eireann drivers over the May Bank holiday weekend illustrates the growing awareness within the working class of the threat privatisation presents to the common good. This new reality resulted in a media, less confident in rolling out its usual anti-public service worker rhetoric, being reduced to quoting employers groups complaining of decreases in foot fall in city centre shops in an attempt to attack the strike. The campaigns to prevent the establishment of Irish Water, as a first stage in the privatisation of this utility, as well as the 2014 Greyhound Refuse dispute has educated many to the dangers of the privatisation agenda. In the lead up to the 48 hour strike, bus workers also effectively outlined to service users what will be the real impacts of privatisation; among them the eventual removal of free travel passes, the cutting back of services and realignment of bus routes to serve profit generation rather that community needs. These wider social factors have reinforced the militancy of SIPTU and NBRU members who after accepting two rounds of cuts to their terms and conditions of employment in recent years, now face the prospect of being forced into working for private contractors. This threat resulted in over 90% of members of both unions voting for strike action in ballots during April. At the core of the dispute is an attempt to privatise 10% of bus routes during 2016. If implemented this plan, drawn up by the National Transport Authority with the connivance of senior management in the bus companies, will see 10% of all Dublin Bus and Bus Eireann routes placed out to tender. This initial wave of privatisation in intended to involve 10% of bus routes in Dublin and the effective total privatisation of the service in Waterford City. Despite attempts by the NTA to claiming it is forced into privatising a proportion of routes by EU directives, it is accepted that the agenda is being driven by the Government along with a cohort of neoliberal influenced senior managers in the bus companies and NTA. Their claim is that the publicly owned companies can also ‘compete’ to for the routes being tendered. However, the tender terms are yet to be published but the NTA is refusing to remove workers’ wages from consideration, meaning that the agenda of driving down terms and conditions of workers while also defunding services through the cutting of the state subvention to bus transport till it is now one of the lowest in Europe, reveals the real aim is one of opening yet more public services to private capital. Despite both unions stating publically their opposition to privatisation they did agree to engage in talks with the NTA, management and Department of Transport officials on the implementation of the tendering of 10% of routes. These talks, facilitated by the Labour Relations Commission, began last July. With no progress reported and the companies stating they intended to transfer drivers as well as buses to private contractors who successfully win the tenders, the talks broke down in April. Prior to embarking on strike action, SIPTU outlined a six point agenda which would protect workers terms of employment and, its members hope, safeguard against a further privatisation of services. The NBRU has instigated legal proceedings challenging the NTA’s authority to undertake the tendering process. In response the management of the bus companies have stated they intend to sue the unions claiming that they have breached the 1990 Industrial Relation Act by conducting a dispute which has gone beyond industrial relations issues and has the political aim of ending the Government endorsed policy of bus privatisation. In the days leading up to the 48 hour bus strike over 1st and 2nd May, Fine Gael TD and Minister for Transport Paschal Donohue verbally stated that no bus drivers would be forcibly transferred to private contractors. This unspecified reassure is only a partial response to one of the drivers’ concerns. With further strike action set to commence on Friday, 15th May, the supporters of the neo-liberal agenda in Government and the State bureaucracy will have the choice of whether to curtail their privatisation push, for now, or attempt force it through in the face of growing union and public militancy. Under the agreement, private operators will also have to comply with proposed legislation protecting public service provision and the terms and conditions of transport workers or face sanctions, including possible loss of contract. It was also agreed that public transport companies will not have to carry any legacy costs arising from the tendering of routes to private companies. The protection of public services remains an ongoing struggle for workers, communities and unions. Below is a brief overview of the recent right2water conference for those that were not in attendance. A range of issues could be discussed but these are simply what we felt are the key points. On May 1st, the traditional day of workers celebration and mass action, a function room in the head office of the Communication Workers Union in Dublin was filled with 180 guests for a day of presentations and discussion. The Right2Water Campaign, an important component of a much larger mass movement fighting water charges, called a conference entitled A Platform for Renewal. As a result of limited information in the weeks leading up to the event speculation had been rife. A new political alliance or party? Policies for the Water Movement? A new alliance of movements or the widening of a deeply effective, empowered and conscious force? In the end what transpired was what can positively be seen as a starting point for a broader political alliance of unions and communities on a range of issues. 180 guests. 60 from each of the Right2Water designated pillars (Trade Unions, Politics and the Community), and a packed schedule of speakers from Podemos, Syriza and the Berlin Water Movement as well as a quick fire look at struggles and perspectives from Ireland with water campaigns in the north, political economy from Trademark and a report on a study of the water movement occupied the majority of the day. The final part of the day moved from broad discussion to a specific set of proposals. Michael Taft and Brendan Ogle of UNITE presented ‘Policy Principles for a Progressive Irish Government’. 7 topics emerged, with a ‘Right2’ prefix covering Water, Work, Housing, Health, Education, Debt Justice and Democratic Reform. This was argued to be ‘the beginning’ of a process of ‘debate and discussion’ which should go out to every corner of the island and every community. We would encourage all trade unionists and communities to get involved in this process collectively. Meet and discuss the proposals and make a submission in this way they will more genuinely reflect the views of working people and communities. To get to this point much has happened. Social Partnership collapsed and the trade union movement had no response. It couldn’t prevent the attack on workers terms and conditions of employment and rights by successive governments and employers. While there were occasional national mobilisations there was no sustained campaign against austerity and all too often the brave and heroic stands were by small groups of workers with little to lose (La Senza, Thomas Cooke, Paris Bakery and Greyhound). The Trade Unions engaged with the Water Movement has started to change this. 5 Unions – Mandate, UNITE, CWU, CPSU and OPASTI – have been involved in a serious and effective mass movement and now are setting out a political program. They are encouraging the rest of the trade union movement to follow suit and actively engage with communities and thousands of workers who are not members of any union. Political parties from the left, to independents to moderate ex labour and Sinn Fein are in the room together engaging on these union proposals. Communities, the grassroots of the movement, are also at the table, although still underrepresented considering the centrality of their role in the water movement and wider challenges to existing power in Ireland. This is an unprecedented and a positive step forward. The TULF has constantly argued the trade union movements is in the unique, structural, position to pull together a serious class conscious movement of working people fighting for radical and meaningful change. Important questions remain and points are still left unanswered. What is needed to achieve what Right2Water have set out? Certainly some have a modest idea of just a policy platform, others would like this to be the start of a push for a left government but still more wish to see this as a movement for a deeper transformation of Irish society. What infrastructure is needed in terms of policies, media, education, or other institutions? What tactics, strategies, vision and ideas are necessary as first steps or as longer term goals for a more fundamental transformation of Ireland? In terms of the policies to be debated what is needed or wanted by the left, by radicals and by class conscious activists? What can be added, how can it be engaged and proposed? Finally what of democracy? What are the challenges and opportunities of 6 weeks of consultation that exist, of debate and discussion beyond 6 weeks? How can this process exist to deepen class conscious debate and empowerment? If democracy and empowerment is the starting point of renewal what of extending democracy to politics as a whole or even to the society and economy we live in, to the work places and communities in which we exist, to every part of the nation? How does a deeper vision of democracy clash with the powers that be in Ireland the EU, and a stringent anti-democratic global order? Many more questions exist, many more points need to be debated, discussed and teased out. Hopefully we can engage with the proposals critically and constructively and seeing them within the context of a wider deepening of democracy and the class struggle necessary for more substantive change. The TULF will be making a submission to r2w and will publish this shortly. Some people are under the illusion that the role of Human Resources (HR) is to ensure fairness in work or to speak up for staff members when business decisions are being made. This couldn’t be further from the truth. The role of HR—in many ways explained in the title itself—is to manage the human resources that are applied in the production process to reproduce capital. It is to support the business in maximising the efficiency of labour in the production process. Modern HR techniques, including the application of new technologies to the management of staff, are developing apace. On-line tools decide on annual leave and create rotas. In big companies, updates from HR come via intranet links. The language of “open doors,” “direct engagement” and “transparency” is repeatedly used to hide the lack of transparency and lack of engagement. Scientific management of the division of labour is nothing new; indeed many of the most ground-breaking developments occurred a century ago. But new technology is now bringing this process, once again, to new levels. Every aspect of work, and the working day, is now recorded, tracked, measured, and used to rate workers and to pit them against each other. Tasks completed, length of time for each task, toilet breaks and starting and finishing times are all routinely recorded and used to rate workers and drive efficiencies: how many phone calls you’ve answered, hamburgers you’ve made, cheques you’ve processed, sales you’ve made, etc. Championed in call centres, these are now being introduced in a wide variety of industries. Smartphones with GPS add a new opportunity: location-tracking. Under the guise of maximising service to customers, the GPS tracking of workers is on the up, bringing with it a host of privacy issues. But, as we know, people’s right to privacy will be trumped with ease by work-place efficiency and management. The real reason for the increasing use of GPS tracking is control. Knowing the location of workers facilitates further control of those workers by the business; and HR facilitate this technology and reports on it. Firstly through some kind of performance improvement plan (PIP), and then disciplinary action, they can legally sack people on the grounds of poor performance; and that is a central function of HR these days. This culture creates submission and fear in the work force, which increase the management’s control and its ability to reproduce capital. This is the role HR plays and this is why workers need to organise their power collectively to challenge this. The World Federation of Trade Unions representing 90 million workers in 126 countries around the world condemns the recent acts of violence against foreign nationals in South Africa. Suffering under the chronic results of colonialism, imperialism, the plundering of natural resources by the monopolies and capitalist exploitation, local and foreign workers, no matter which country they end up living in, are powerful only in joint fraternal struggles in social alliance with self-employed and poor farmers against their common enemies. Racism, xenophobia and all other acts of discrimination are an instrument of division and tactics to scapegoat the vulnerable sections of the working class in order to hide the real culprits for the people’s suffering. The WFTU at the same time distinguishes itself from the cosmopolitanism promoted by various Organizations towards migration using phrases such as “global village”, “migration must be seen as economic growth factor” and “cultural mixing” which put workers in the shoes and mindset of their exploiters. This perception aims to justify the inhumane consequence of imperialism which is economic and labour migration. This is a phenomenon which greatly assists the capitalists to double exploit the desperate migrant workers while pushing further down the rights of all working class in each country. Many times, when foreign workers are not needed any more in the specific profit-making endeavors of the monopolies, they are dealt with as a problematic factor for the economy. The WFTU and the class-oriented trade union movement struggle so that no worker is forced to abandon their homes and families for survival or employment. Local and migrant workers in each country have no other way but to fraternally come together inside the trade unions and in the same struggles demanding equal rights, better working and living conditions, increased wages, social and labour rights and ultimately the abolition of capitalist exploitation and imperialism which are to blame for their suffering. The WFTU, noting the experiences, the traditions and the values of the South African people and especially the black population who have suffered greatly under the colonialism and apartheid, feels optimistic that the South African working class will confront such acts and those who instigate them, will utilize its internationalist and proletarian solidarity to further infuse unity amongst workers inside and outside of the country and will find the causes of the problems in the political level and capitalist mode of production which is to blame for the continuing existence of poverty, unemployment and inequality. In May of this year the Socialist Voice, in association with The New Theatre, will host its very first week long political/cultural festival in the heart of Dublin City. This festival is an extension of the ‘James Connolly Memorial Weekend’, where esteemed national and international guest speakers such as James Petras have given the James Connolly Memorial lecture. This is followed by a wreath laying ceremony at Arbour Hill on the Sunday, to mark the occasion of Connolly’s execution and to pay tribute to him and to the other leaders of the 1916 rising. 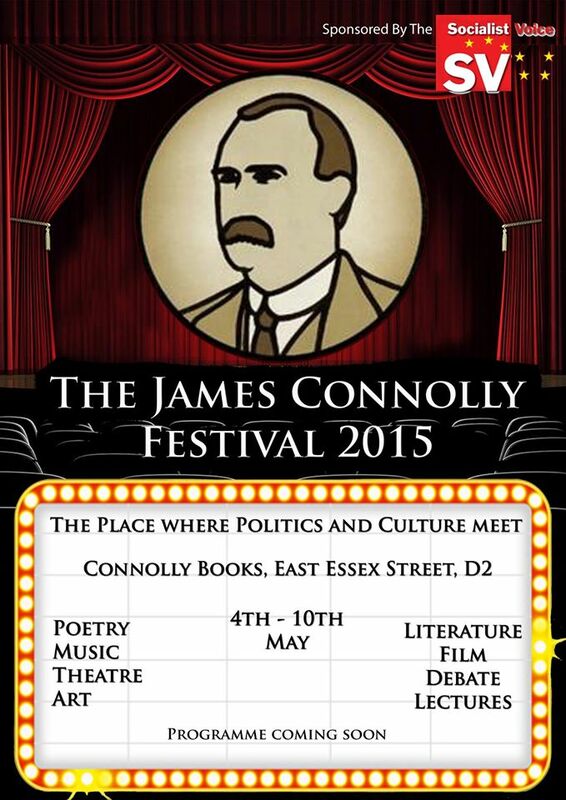 In May 2015 the Socialist Voice and The New Theatre will launch the first annual ‘James Connolly Festival’ which will host a broad list of cultural and political acts and events – with music, theatre, poetry, films, art, debates and lectures intended for a new risen people. Acts confirmed so far include: Sister Teresa Forcades (Euorpe’s most radical nun/political activist), Attila the Stockbroker (political poet/musician/activist), Mark Geary (singer/songwriter), Fiach Moriarty (singer/songwriter), Stephen Murphy (poet), Donal O’Kelly (actor/director), Evelyn Campbell (singer), Ronan Wilmot (actor/director), Andrew Kerns (singer), Micheline Sheehy-Skeffington (Academic) and many more. The Festival held a fundraiser night, which was dedicated to the Dunnes Stores workers who went out on strike this month. The play Counter Culture was written and performed by Katie O’Kelly and Theo Dorgan read extracts from Pablo Neruda and from his own work, which were mesmerising. A video of the night can be found on the facebook page and website. The aim of the festival is to promote progressive culture and politics and to facilitate debate around current and contemporary politics. James Connolly remains Ireland’s foremost Marxist and working class hero. He of course was one of the founders of the Irish trade union movement, so one of the main goals of the festival will be to highlight the ideas of Connolly and the importance of trade unions for workers, especially amongst the youth. The festival is aimed at those who seek alternatives, who are engaged in today’s struggles against the many powers that dominate our lives, but also to celebrate the very rich working class culture that exists in Ireland. 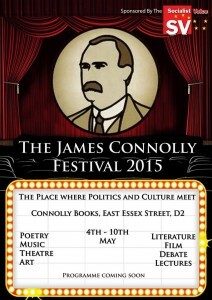 For full details see the festival programme in this months Socialist Voice or online at jamesconnollyfestival.com. One of the central political events will be this year’s James Connolly Memorial Lecture, on Saturday 9 May at 2pm in the New Theatre, East Essex Street, to be given by the radical Catalan nun and activist SisterTeresa Forcades. The lecture will be followed by the formal launch of the CPI’s “Democratic Programme for the 21st Century.” On Sunday 10 May the CPI’s annual Connolly Commemoration will take place in Arbour Hill Cemetery, with an oration by the CPI and the Connolly Youth Movement, together with this year’s guest speaker, Clare Daly TD. This event starts at 3pm and all are welcome. ‘Fight for 15’ has become the rallying cry of fast food workers across the United States. The movement began with 200 workers walking off their jobs in New York City in November 2012, in protest at employers who make billions of dollars in profits while paying poverty wages. Over the last two years the protests have spread. The last major day of action on 4th December, 2014, saw thousands of fast food workers in some 190 US cities walk off their jobs, seeking the same demand they have been making for the past two years – $15 an hour in pay. On that day solidarity actions and protests were also witnessed from Japan to Brazil, while in Ireland 3 protests organised by the Young Workers Network (in Dublin, Cork and Belfast) marked the global protest with lively actions outside of McDonalds. Social media has been central to organising the campaign and on 4th December the #fastfoodglobal hashtag trended in nearly 20 US cities from New York to Phoenix, and around the world it trended in 50 cities from London to Lagos. 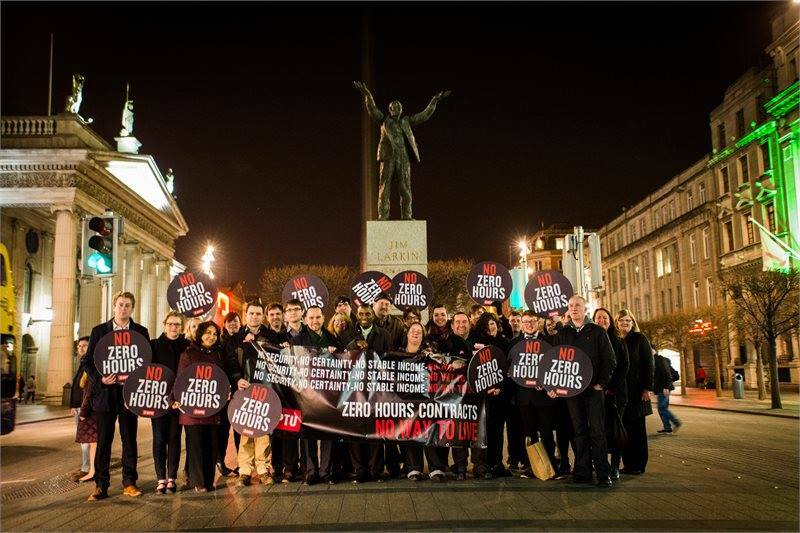 Activists in the ‘Fight for 15’ campaign made a three day visit to Dublin in early March to discuss the struggle in the US and Ireland against low pay and zero hour contracts. 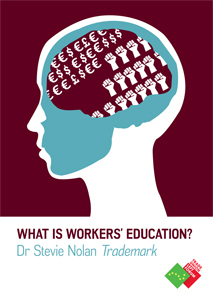 The workers spoke at a public meeting in Wynn’s Hotel, Dublin, organised by the Young Workers Network (YWN). The meeting was followed by a protest at the Jim Larkin Statue on Dublin’s O’ Connell Street. The YWN will be holding another protest outside McDonalds on O’ Connell Street, Dublin, against low pay and zero hour contracts on 15th April as part of an international day of action against low pay and are encouraging supporters to meet them at Liberty Hall at 5:30pm on the day for this event. At the event, the YWN will launch the result of their Working Hours and Pay Survey which found that 89.13% of young workers under 35 regularly find it difficult to make ends meet.